FROM the Malaysian Cabinet to the man-in-the-street in Kuala Lumpur or Penang, or even in Singapore, it’s close to unbelievable to hear Goldman Sachs Group blowing its own trumpet on “principles and credibility”. Singapore leaders on Sunday (Dec 23) expressed their condolences after a tsunami struck coastal areas around the Sunda Strait between the islands of Sumatra and Java in Indonesia on Saturday night. At least 200 people have died and hundreds more have been injured, according to Indonesian authorities. The United Nations has passed a resolution to adopt a new convention on mediation and name it after Singapore, a move that experts say is a nod to the Republic’s success in building a strong hub for international dispute resolution. 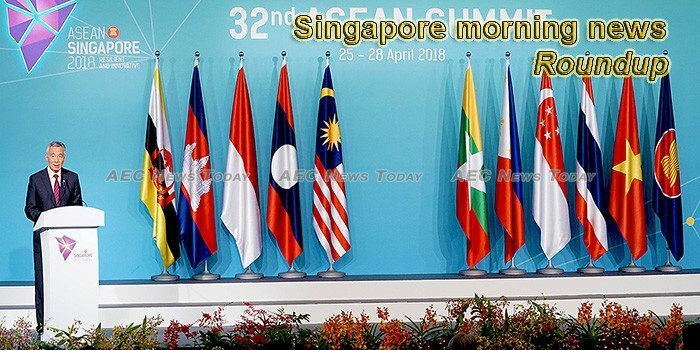 Former Singapore prime minister Goh Chok Tong urged Malaysia and Singapore to react calmly as the two South-east Asian neighbours lock horns over their maritime borders. Minister-in-charge of Muslim Affairs Masagos Zulkifli will be leading Singapore’s delegation to the annual Haj Ministerial Meeting in Saudi Arabia from Monday (Dec 24) to Friday. Singapore – Ms. Sun Xueling, Senior Parliamentary Secretary for Home Affairs and National Development, launched an anti-drink driving campaign on December 21 (Friday). Mr Chan Cheow Hoe, the country’s first Government Chief Digital Technology Officer, is pushing for more in the civil service to think of citizens as their “customers” when developing digital services, but also asks for people’s patience when these services do go down. Food establishments involved in significant food poisoning incidents now face even stiffer penalties, following a series of large-scale incidents in the last two months which involved around 600 people and resulted in one death. Sunny Singapore can get a little too hot sometimes. And when it does, citizens seek refuge in air-conditioned rooms and take showers. A Jetstar flight departing Changi Airport to the Australian city of Melbourne on Thursday evening (Dec 20) has been delayed for almost 30 hours, with passengers told that the flight will only leave Singapore at 1.30am on Saturday. Singapore has excellent logistics, infrastructure and a trade eco-system, but we cannot assume there would no disruptions to our food supplies, says Paul Teng. Measures are in place in Singapore to prevent illegal drone use like that which disrupted flights at London’s Gatwick Airport for 36 hours from last Wednesday. Private security officers who slack off, sleep on the job or come to work drunk can face tougher punishment from next year, as the police seek to boost the industry’s professionalism and bolster Singapore’s defences. A joint press release by the Government Technology Agency of Singapore (GovTech) and Cyber Security Agency of Singapore (CSA) reveal the government’s collaboration with local and overseas ethical hackers to search for vulnerabilities in SG’s IT systems for a fee. Designated fishing grounds at Lower Peirce Reservoir and Upper Seletar Reservoir will be closed until further notice, water agency PUB said. Markets in Singapore and across most of Asia look set for quiet trading this week as worries continue to mute investors’ appetites for eating, drinking and merrymaking. The official inquiry into June’s SingHealth cyber attack has yet to submit its report, but a clear message has emerged from the extensive sessions – cybersecurity needs to be taken more seriously in Singapore. Singaporeans suffering from a heart condition may soon be able to get specialist help more quickly if a new artificial intelligence-driven start-up gains regulatory approval to distribute its system here. Singapore will on Monday release November numbers for consumer prices, highlighting an extremely light day for Asia-Pacific economic activity. The bourse booked the second lowest performance since 2008. When the going gets tough, many companies turn to property as a possible panacea – with several of them unveiling plans in recent months to diversify into the sector. Traffic to and from India jumped 14%, making it ahead of Changi’s top 10 markets. Singapore-based venture capital firm, Play Ventures has raised $22.4 million of its targeted $40-million debut fund, according to an SEC filing. Total business expenditure commitments amounted to $6.5b. Singapore-based private equity firm Triple P Capital has announced the 100 per cent acquisition of Contemi Group, an insurance IT solutions provider which mostly operates in Asia and Scandinavia, according to a release. SoftBank Group Corp is nearing a deal to invest $1.5 billion in Grab, three times a previously expected $500 million, as Southeast Asia’s biggest ride-hailing firm looks to expand, a person with knowledge of the matter said. Prudential Inc’s realty investment arm M&G Real Estate has acquired a 50 per cent share in a portfolio of industrial properties across Sydney and Brisbane, in a bid to diversify the firm’s exposure in Australia, it said in a statement on Friday. Big steps in the e-payments scene here were made in 2018, as Singapore moved closer to its aim of becoming a cashless society. They may be low in income, but their love for their neighbours overflows in richness. The earlier you start investing, the earlier you can reach your financial goals. Telco StarHub brought together some of Asia’s leading entertainment personalities at the Marina Bay Sands in Singapore for its inaugural ‘Night of the Stars’ awards on December 22. Budget international schools have been emerging to cater to expats working here on local terms. Studies around the world have long indicated a greater tendency for animal doctors to take their own lives. Now, in Singapore, the issue of mental well-being in the profession is slowly coming into focus.